Caroma Packaging Group - Get 1 of each - total 3 items. Caroma Packaging Group Photo. Each package full color attraction, sure to get attention on the shelf, with hanging tag, UCC labeled. Caroma appliance package comes with diffuser, 3 vials Mental Energy Oil includes 3 wicks and caps. 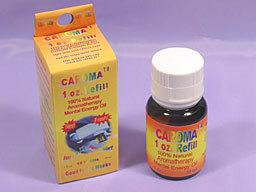 Caroma refill pack comes with 3 vials Mental Energy Oil with wicks and caps. Caroma 1 oz. refill package comes with 1 oz. Mental Energy Oil in bottle with pour out lip to make it easy for refilling into the vials. This entire package will last for up to 42 weeks. Caroma automobile dashboard aromatherapy socket diffuser. 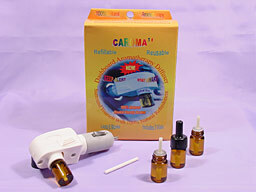 Caroma appliance package comes with diffuser, 3 vials Mental Energy Oil includes 3 wicks and caps. Will last up to 6 weeks. Replenish fast with refill in less than 1 minute of your time every 2 weeks. Now you can have 24/7 aromatherapy for your automobile. Caroma�s improved design allows you to never have to travel without the sweet smells of natural refreshment again! Working under the same principle as Electra�Essence�, Caroma� can stay plugged into your dashboard accessory electric socket without ever having to be unplugged, 24/7. Each unit comes with 3 vials Mental Energy oil. Each vial and wick will last up to a year or longer of every day use. Caroma� vials will last for 2 weeks with your favorite essential oil or essential oil blend without ever needing attendance or maintenance, unless you want to change the aroma. Caroma� will not run down your battery. This innovation will allow your automobile to be filled with the fragrant smells of nature 24/7. If having to never add oil every time you want to fragrance your auto or never having to change out dirty sticky pads when they become decrepit appeals to you, then you will love Caroma�. Caroma� takes less than 1 minute to refill with your favorite essential oil or essential oil blend. Can use any fragrance oil you like including perfumes and colognes. Just another innovation in aromatic accessories brought to you by Whole Spectrum�, the company who has your interests of better living through aromatherapy at heart and not at your wallet. We don�t sit around milking outmoded products, we are continually innovating to bring you better, more economic and more convenient to use aromatic accessories so you can enjoy the full benefits of aromatherapy without having to take up your most valuable assets, your money and your precious time. Caroma 1 oz. Refill Pack good for 15 refills or up to 30 weeks. Caroma 1 oz. refill package comes with 1 oz. Mental Energy Oil in bottle with pour out lip to make it easy for refilling into the vials. Will last for up to 30 weeks use 24/7. 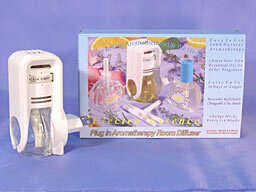 Electra'Essence plug in aromatherapy diffuser for indoor rooms with 3 wicks. Electra�Essence� is the newest and most innovative, convenient, easy to use and maintain diffuser now available for the aromatherapy consumer. Its subtle and understated effect is never over-powering but just right. It is ideal for those who cannot tolerate strong odors but who nonetheless want a more refreshing and clean indoor environment. It works in the same manner as the plug-ins you see in the store, only you get to choose the fragrance you want. Electra�Essence� is able to enhance the room environment without everyone asking: What Is That Smell? It makes everyone naturally feel better without anyone really knowing why. You can just sit back and smile and say thank you very much to the compliments of your home! You can smile and relax because the efficiency of Electra�Essence� allows up to one full month of non-stop fragrancing of your choice. You pick the fragrance you want! And change it as often as you like! Simply exchange the easy to replace 1 oz. bottle with another of your favorite aromatherapy products. Extra refill bottles are only 1.95�. Buy them plain or filled with your favorite essential oil or essential oil blend for the cost of the oil and pay nothing for the bottle. Make it easy for yourself and your family to have a better quality of life with all the benefits of aromatherapy by adding an Electra�Essence� to every room. The most ideal places are bedrooms, bathrooms, and other small enclosed areas up to 100 square feet. Larger areas may require more than one to scent the entire area. Electra�Essence� is an electric socket heat-generated diffuser that gently and subtly releases the aromatic molecules over a long period of time, up to one month or longer for all but about 15 essential oils. 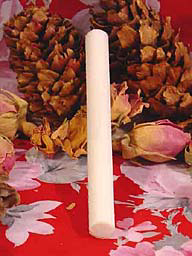 It is completely safe and easy to use, requiring little to no maintenance, unlike the scentballs. Simply fill the bottle with your favorite essential oil or order it filled with your favorite essential oil, insert the easy to apply orifice reducer and then insert the wick into the bottle via the reducer. Adjust the manual setting to desired level (from maximum to minimum - 5 settings in all). It is recommended to start at max level and then adjust to preference after 2 days. Insert bottle into Electra�Essence� and plug into the wall. The easy to adjust electric prongs can fit vertical or horizonal outlets. Then sit back and relax for up to 30 days without having to visit it again. For optimum performance Electra'Essence requires a change of wicks every 3-4 weeks. Refill bottle comes with 3 wicks. Put your own oil into it. 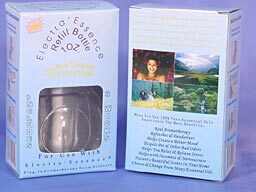 Electra'Essence 10 Wick Refill Pack.